In addition, coronal hole 468 produced a high speed stream of solar winds (charged particles). 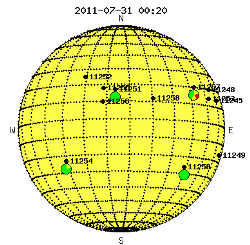 Today’s geomagnetic storm is most likely a combination of several C-class flares, one M-class and CH 468. Today July 30th, a large M-class flare registering as M9.3 (out of 10) unleashed from sunspot region 1261. 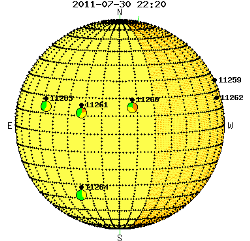 This event will not affect the Earth’s magnetic field for 48 to 72 hours. As a result, the Earth is most likely to experience ongoing effects in the way of extreme weather which includes hurricanes, tornadoes, wind shears, straight-line winds, earthquake and volcanic activity. This entry was posted in 2012, ancient text, asteroids, astrology, astronomy, comets, cycle 24, earth changes, earth’s core, earthchangesmedia, earthquakes, extreme weather, floods, galactic center, galaxy, hopi prophecy, lunar eclipse, mayan prophecy, mitch battros, pole shift, science, solar eclipse, solar storm, space, space weather, sun-earth-connection, sunspots, tsunami, Uncategorized, universe, volcanoes, weather and tagged 2012, ancient text, charged particles, earth changes, mayan prophecy, mitch battros, space, space weather, sunspots. Bookmark the permalink.